Present in numbers, eleven players in total but most unusually for China at the forthcoming Seamaster 2019 ITTF Challenge Plus Portugal Open only one member of that group appears amongst the 32 seeded names. The name in question is Liu Shiwen who heads the list, for her colleagues in action in Lisbon play starts in the qualification tournament on Wednesday 13th February. Immediately the name of Hu Limei attracts the attention, in 2014 she used her defensive skills to good effect to win the women’s singles title on the ITTF World Tour in Qatar. Equally, in the same year Fan Siqi was the runner up in Argentina, whilst last year in under 21 women’s singles events, Guo Yuhan and Li Jiayuan contested the final in DPR Korea, the former emerging the winner. Also in Germany, Huang Yingqi concluded matters on the second step of the podium. Meanwhile, on the 2018 ITTF World Junior Circuit Wu Yangchen won in Hungary, Zhang Binyue succeeded in Oman and also on home soil in Taicang. All have a pedigree of success, one with no such international credentials is that of 22 year old Yang Huijing; notably she partners Wang Chuqin in the mixed doubles event. All are most capable of upsetting the order of merit, all have the ability to reach the main draw but it is the two youngest members of the Chinese women’s team in Lisbon who attract my attention. Making their first steps on the senior scene; the names of Kuai Man and Chen Yi, the players who currently occupy the respective top two positions on the under 15 girls’ world rankings, appear on the entry list. Last year both enjoyed outstanding success; they met in the cadet girls’ singles final at the Asian Junior and Cadet Championships in Myanmar, Kuai Man emerging the winner; later in the year she was to repeat the success in Tottori, she emerged successful at the ITTF World Cadet Challenge. 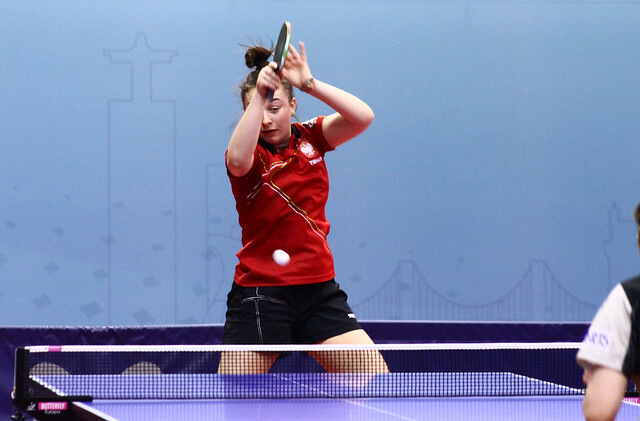 Similarly on the ITTF World Junior Circuit, Kuai Man won the cadet girls’ singles title on home soil in China as well as on her travels in Croatia; furthermore, she was the runner up in Oman, whilst being in junior girls’ singles semi-finalist in both China and Croatia. An outstanding record but more than equalled by Chen Yi; beaten the final by Kuai Man in Taicang, she won the cadet girls’ singles events in the Czech Republic, Thailand, Hong Kong and Hungary; additionally, she was the junior girls’ singles runner up in China and a semi-finalist in Hungary. Similar to their colleagues present in Lisbon, even though success is only at junior level, they have considerable experience; in the Portuguese capital city having nothing to lose; more senior players may well face a testing time. Note the names Kuai Man and Chen Yi; future Olympic Games and World champions?